In 2015, Michael won $25,000 award from the Davidson Institute for Talent Development! Also in 2015, Michael won the ASCAP Foundation Morton Gould Young Composer Award for his piece, “Stained Glass and Birds II” for for piano and violin! Check out this 2015 feature on Michael by Fox News. Michael Jon Bennett appeared on Show 281, recorded in January 2014, at age 15. 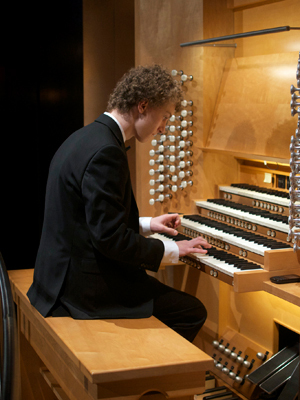 Michael Jon Bennett (organ), 15, currently studies organ performance, organ improvisation, piano performance, and musical composition. His teachers include Peter Richard Conte, Grand Court Organist for the Wanamaker Organ, in Philadelphia, Pennsylvania; Raymond Nagem of Juilliard for organ; Dorothy Papadakos, former organist for Saint John the Divine Cathedral in New York City for organ improvisation; Dr. Ernest Barretta of Juilliard for piano performance and Dr. Andrew Thomas of Juilliard for composition. He is currently studying at the Juilliard Pre-College Division in New York City. Michael is home-schooled and enjoys opera, conducting, and participating in his church. Michael Jon is a Jack Kent Cooke Young Artist.